Place the minced garlic, finely chopped basil, and olive oil in a food processor and blend into a flavoured oil. Season with salt and pepper. Slice the zucchinis into 3.5mm slices. Slice the truss tomatoes into 6mm slices. Place on a layers of paper towel to soak up any excess moisture and set aside. Press pastry into a large tart tin and brush lightly with basil-garlic oil. Sprinkle on all of the parmesan cheese. 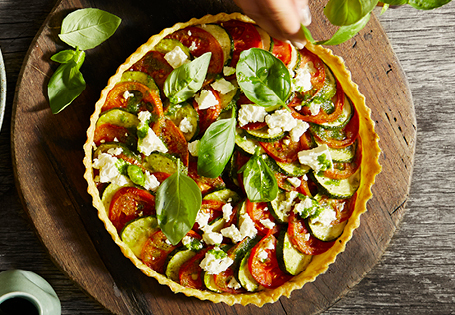 Starting on the outside edge, layer the zucchini and truss tomatoe slices alternately in a circular pattern – be sure to tightly layer them against each other as they will shrink once baked). Try to leave the bigger slices on the outside and small slices for the inner circles. Continue until the entire tart shell is filled. Brush vegetables generously with basil-garlic oil and season with salt and pepper. Bake at 200°C (or 180°C for fan forced ovens) for 30-45 minutes, or until the truss tomatoes and zucchini are soft and lightly caramelised. Sprinkle with crumbled feta and fresh basil, and serve warm or at room temperature.